For the game as it come to my sight. My child, and the grave of my mother. And there rest, ere I stepp'd on its floor. Not so happy as then I could be. That covers my old mother's grave. Do they miss me at home, do they miss me? Were saying I wish he was here. To know that they missed me at home. And sigh that I tarry so long ? Regret at my wearisome stay. And the stars in the calm azure sky ? A whispered good night while they weep ? A whispered good night while they weep. At morning, at noon, or at night ? That only my presence can light ? Because I am with them no more. Two ballads. 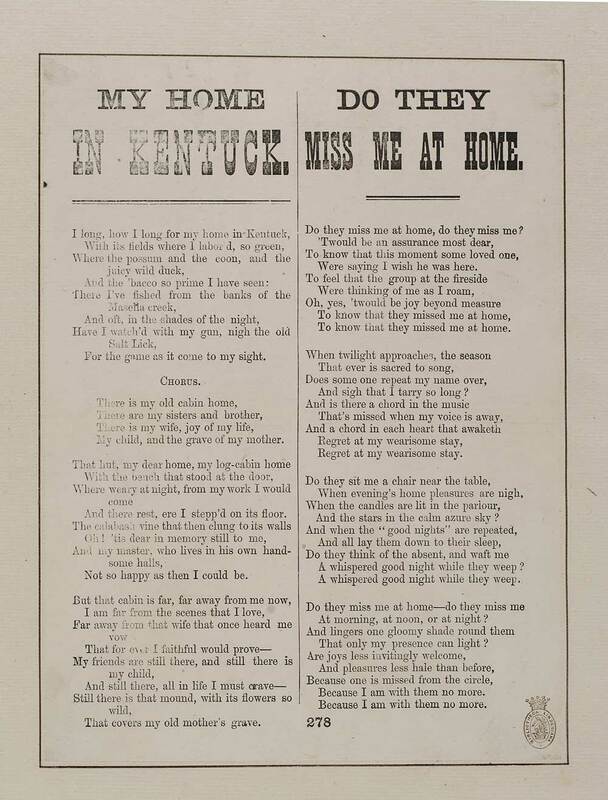 My home in Kentuck - first line reads: I long, how I long for my home in Kentuck. Do they miss me at home - first line reads: Do they miss me at home, do they miss me?